Digitalization is clearly impacting manufacturing in the same way that it has revolutionized the business world and consumer markets.Industrie 4.0 resembles that next level of manufacturing: Production based on cyber physical systems. Such digital enterprise is fundamentally more economically efficient than others that haven’t embraced digital technology, integrating information, processes, work and people so that the entire organization can collaborate more efficiently and effectively. Manufacturers recognize the need to respond to with significant speed, flexibility and efficiency improvements of their production. This is to be achieved by implementing a holistic digitalized approach stretching over the complete value-chain including suppliers. Siemens provides a solution to that development with its Digital Enterprise Software Suite. It describes the end-to-end integration of PLM, MES and automation throughout the entire value chain, with Teamcenter as the data backbone. Thereby, Siemens offers Softwaretools to build a complete Digital Twin that replicates the customers product plant and process in a virtual world. Customers can now optimize their manufacturing operations, and guarantee the manufacturability of new products. Yet, a Digital Enterprise is only as efficient as the assets at the heart of its manufacturing operations. A failure of a critical machine can destroy the speed, efficiency and agility that the customer’s business relies on. Siemens is using big data to optimize the performance of our customers plant via “MindSphere”, a cloud-based open platform to connect, monitor and optimize plant assets and plants performance. After all, the lifecycle of a manufactured product itself does not stop when delivered. “Omneo” captures, cleans and contextualizes data from every phase of the product lifecycle and delivers insights to help all the stakeholders of the Digital Enterprise provide the best service to their customers. After completing his studies in physics followed by a doctoral thesis in computer science at the University of Karlsruhe, in 1997 Weckesser started his career with Siemens in Erlangen. There he was a project manager in development for the Motion Control (MC) business area of the then Automation and Drives (A&D) Group. 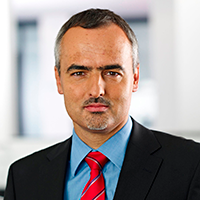 Two years later he took on a position in Nuremberg at the former A&D Automation Systems (AS) business, and from 1999 to 2004 he held various positions in the areas of development, product management, business development and strategy. From 2004 to 2007 Weckesser worked in Atlanta, Georgia, where he was responsible for the profitable expansion of local A&D AS business activities. In 2007 he moved back to Nuremberg and took over productject management for Simatic HMI (Human Machine Interface) and IPC (Industrial PCs). In October 2011 he was named CEO of the Value Services Business Unit of the Industry Sector Division Customer Services and in October 2014 he was appointed CEO of the Business Unit Customer Services within the Digital Factory Division. In January 2016 he became COO (Chief Operating Officer) of the Business Unit Product Lifecycle Management within the Digital Factory Division.